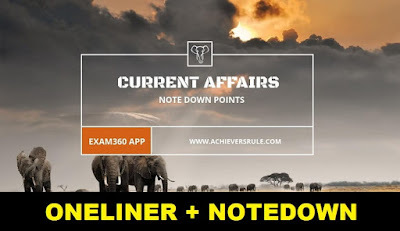 One Liner GK Current Affairs for 23rd April 2018 has Latest Current Affairs One Liners which are very important for the upcoming examinations of Bank, Rail and SSC. A List of GK points have been added at the end of the article which are very important for all kinds of examinations. Other than it can also help you to boost your knowledge in various kinds of genres. Aspirants can also follow the Daily Current Affairs Updates and Daily Current Affairs Quiz. Nitish Kumar released the books titled- 'Mister M K Gandhi Ki Champaran Diary' written by Arvind Mohan, 'Champaran Andolan 1917' edited by Ashutosh Partheshwar and 'Pir Muhammad Munis: Kalam Ka Satyagrahi' collected and edited by Srikant. Rafael Nadal powered to a record 11th Monte Carlo Masters title with a straight-sets victory over Kei Nishikori.